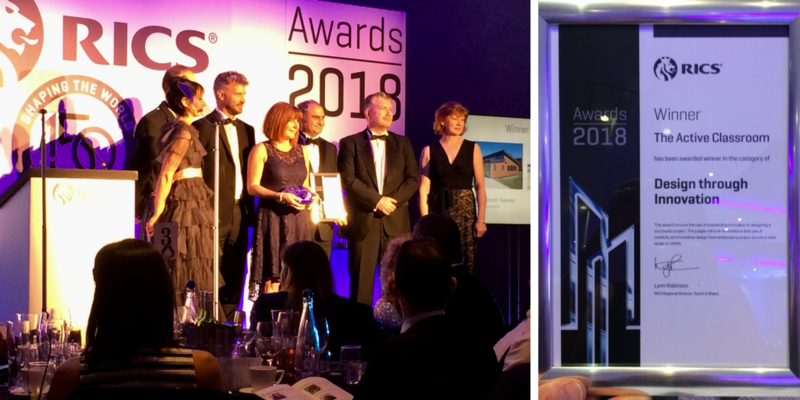 We’re delighted to announce that The Active Classroom has received huge recognition at the Royal Institution of Chartered Surveyors (RICS) Wales Awards tonight (Wednesday 23rd May); which was held at the Radisson Blu, Cardiff. Subsequently, the classroom will go on to compete against other regional winners at the national RICS Awards Grand Final on November 2018, for the chance to be crowned the overall UK winner in the respective categories! The Active Classroom showcases the work being undertaken at SPECIFIC and has been used to demonstrate Swansea University’s solar research capabilities, in terms of scaling up research from laboratories into the construction industry. The project also incorporates several new solar technologies / products from key partners, such as: building integrated photovoltaic roof (BIPVco), aqueous hybrid ion battery storage (Aquion); a novel resistive heating system developed at SPECIFIC; new coatings for steel cladding (Tata Steel). Data collected from the classroom has proved that the building can generate more energy than it consumes, through its novel generate, store, release technologies. The success of this demonstrator building proves the ‘buildings as power stations’ concept and has acted as a springboard for funding for our next demonstrator building, the Active Office, which will be the UK’s first energy-positive office. We’d like to thank all of our industry and academic partners who helped create the Active Classroom and look forward to creating innovative and sustainable buildings in the future.